I got an advertisement in the mail from a local tack store this week. It was printed to look like a Christmas wish list, personalized with my name at the top. Surprisingly, there was nothing on that alleged list that I actually wanted. Disbelief still hangs heavy in the air. The way lessons are canceling for weather this winter, I suppose I could ask Santa for an indoor arena. But really, does this countryside need yet another big, ugly box of a building? I’m welcome to train at a few barns with indoor arenas close by, but I notice on the cold days, lessons cancel indoors or out. Maybe a new truck? No, mine is broken in really good, no worries about the first scratch or dent. No pesky tailgate and I notice folks cut me a wide girth in traffic. I like that. How about a new pony? Well, certainly no reason to wait for Christmas for that. I’m not doing very well coming up with a wish list and as I look around the place, I don’t get much help. The horses are fat and hairy- sunbathing in herd formation. The donkeys are braying and whacking each other with a flat stall ball. Llamas are doing a line dance across the pasture; the goats are ruminating in the hay. Fred, the duck has commandeered a stall of his own. No one has any idea what the cats are up to. The dogs are strewn around the living room like drunken frat boys. It’s not that the animals lack ambition, they just really excel at the be-here-now reality. It might be the best Christmas wish of all: To want what you have. And I think that means that we are all still celebrating Thanksgiving at Infinity Farm. We love this holiday! Inside or out, there is so much to be grateful for and no silly hats. A Briard, a Bouve and a Cattle Dog? My God, but you’re a brave woman … and my hero now! Great post, well stated! 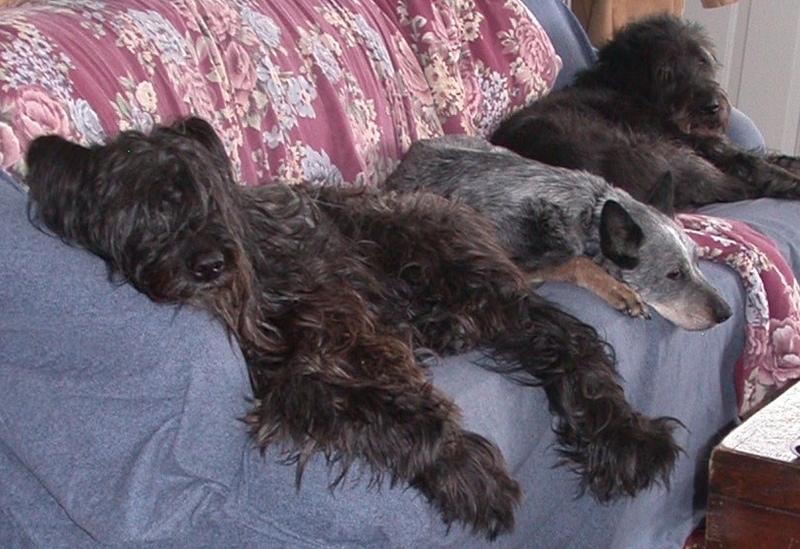 And one more briard, but only so many fit on the couch. I have a taste for bad dogs. I went to you blog, and you seem to suffer the same affliction. Hello, my sister.